Many people meet Michael Cairl for the first time as he sits on the stoop of his North Slope brownstone, rather than at a meeting of some local organization. “It’s great to sit and relax there on my ‘front porch’ on a nice day or evening, see people go by, feed the dogs, and watch the passing parade,” says Cairl, the new president of the Park Slope Civic Council. The Council held the gathering in part to help encourage new voices from the community when discussing the developments along the avenue. Following the forum, even more activity has begun to bubble: improvements to the subway station at Ninth Street, which the Civic Council has been spearheading; plans for planters and perhaps trees along the avenue; and, with funding from Assemblywoman Joan Millman, elimination of one left turn lane at Union Street, which was filled in to create a much safer pedestrian crossing. Plans are now in the works for more Civic Council events that will further this progress. His family moved to Long Island in 1963 but still had relatives in the Slope, including the great aunt whose brownstone Cairl now owns. He went on to attend Fordham University and Columbia University, worked in the Pentagon for Navy procurement, then moved back to New York for an opportunity with a Queens-based defense contractor. That company “decided to diversify into nondefense areas, including the rail market and projects for NYC Transit.” For a while, Cairl handled both transit and defense contracts, but for the last decade he’s been focused solely on transit. Currently, he is handling oversight of light rail projects in Norfolk, Va., and Salt Lake City on behalf of the Federal Transit Administration. Cairl is very active in leadership roles with many other organizations throughout the community: the Grand Army Plaza Coalition, the Brooklyn Greenway Initiative, the Gowanus Community Stakeholder Group, LAMBDA Independent Democrats, and Independent Neighborhood Democrats. He is also an avid biker, photographer, foodie, and jazz junkie. A brownstone owner, Cairl shares his house with his partner and five curious cats. 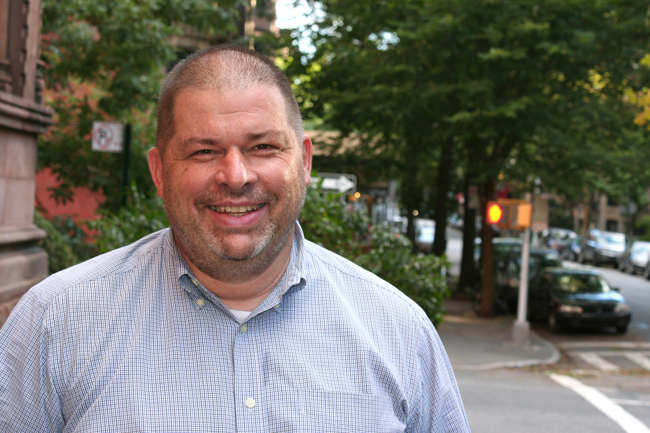 “As a son of Park Slope,” he says, “being Civic Council president would be both a huge honor and a big kick. I have every intention that we will have fun working on the Council. To me, this is a great accomplishment for someone who takes his neighborhood seriously and calls it home. Photographs by David Herman; see more of my photo work for the Park Slope Civic Council in this portfolio.